My good friend Bill recommended that I check out The Adventures of Buckaroo Banzai Across the Eighth Dimension. It was cautious advice, as he wasn’t sure if I’d love it or find it unwatchable. After seeing the movie, I understand his concern: I’m recommending it to you, now—cautiously. In 1984, director W.D. Richter and screenwriter Earl Mac Rauch brought to the big screen a truly weird comedy-sci-fi-adventure-comedy, starring actors who would go on to become huge names. It was full of ideas and long, funny conversations about alternate realities, alien invasions, and the brainwashing of Orson Welles; it also featured a watermelon lodged in a vise on a lab table—but that’s a story for another time. The movie plays like the beginning of a new Star Wars franchise for smart people, and that may be one of the reasons it flopped. The movie stars Peter Weller as Buckaroo Banzai, a famous neurosurgeon who moonlights as a rock star and physicist, and spends a good deal of time saving the planet with his band/league of misfit scientists, the Hong Kong Cavaliers. When a rogue scientist, Dr. Emilio Lizardo (John Lithgow), escapes from a mental institution in order to lead an uprising of the secret alien race whose leader possessed him in the late 30s, Banzai and his gang leap into action to prevent a rival alien faction from blowing up the planet. If that last sentence made your head spin, just try watching the movie. I haven’t mentioned Banzai’s love interest, Penny Priddy (Ellen Barkin), the long-lost twin sister of his former bride; their introduction sees Penny attempting suicide during a Cavaliers concert, and Banzai talks her down by crooning from behind a keyboard. Buckaroo Banzai is kind of like the alternate-dimension sequel to Real Genius, another science-oriented comedy that came out the next year. The films share a very smart sense of humor that engage the mind and the gut; it’s not too dry, but there’s not an over-reliance on easy gags or variations on jokes you’ve heard a hundred times (the exception in Banzai is a running gag about the last name of Christopher Lloyd’s character, John Bigboote). The movies also have great casts in common; Val Kilmer in Genius and Peter Weller in Banzai share a Zen wackiness that grounds their supporting characters while at the same time acting as a catalyst for bizarre plot turns. If I have one complaint about this movie, it’s that the last act is a dud. It makes sense in terms of the story, but dramatically, it just lets the air out of all that’s come before. In brief, Buckaroo and the Cavaliers converge on a hangar to stop Dr. Lizardo from launching a space ship into the eighth dimension—where he will assume great power. Had this been a ten minute distraction, I might have been okay with it; but the last half-hour of this picture is a raid-on-the-compound sequence that is executed without any suspense or attempt at twisting the convention. It’s as if the creative team were very skilled at fashioning clever molecule gags, but didn’t quite get how to stage swashbuckling adventure (hint: it doesn’t involve scene after scene after scene of different people running down similar-looking corridors). 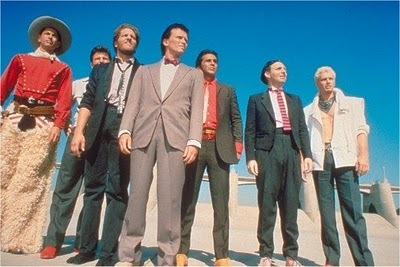 It’s rare that I suggest a film be remade or sequelized, but in the case of Buckaroo Banzai, that could be a great idea. This is the kind of movie that Joss Whedon and J.J. Abrams are making today; it wasn’t right for 1984, but today’s audiences are much more open to unconventional storytelling and self-aware humor. I appreciated the fact that the film demanded my full attention—up to a point—and rewarded me with big ideas and some good laughs. Yeah, we definitely need more of that.